Linda Blair is an actress and animal rights activist. Linda is best known for her role in the film The Exorcist, for which she was nominated for an Academy Award and won a Golden Globe and television films and horror films, various independent films, as well as several television credits (Scariest Places on Earth and Animal Planet’s Pit Boss). In addition to her acting credits, Linda has publicly supported various charitable causes, specifically animal rights. 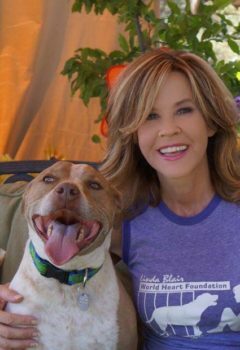 In 2004, she founded the Linda Blair WorldHeart Foundation, which serves to rehabilitate and adopt rescue animals. In addition to all the homeless animals she rescues, she shares her heart with her own pets, Suzie and Johnny (pictured).